WHAT IS A SPRUNG DANCE FLOOR? WHAT IS A SPRING DANCE FLOOR? The art of dance is a physical activity requiring jumping and, more importantly, landing. This activity puts additional stress on joints and bones. Dance shoes alone cannot provide enough cushioning or support, so dance itself can put pressure on the back and knees of each dancer. If a studio is equipped with a professional sprung floating floor, that studio is taking every measure to ensure the health of their students. This floor rests on a system of high density foam that in turn absorbs the shock on the body. Broadway South features high density foam based sprung floors in all studios. If you want to know, if your studio has sprung floors: Sprung floors will generally be above the normal floor level – You should have to step-up into the studio. Also, you will be able to step on the floor and feel the flexibility. The surface on which the dancer dances is also important. Our floors are vinyl “Marley” floors that are well known in the dance world as being THE best surface on which to dance. Professional companies around the world including Alvin Ailey and New York City Ballet all use these types of flooring in their home studios as well as on the road in touring cities. This floor allows the perfect leverage for the dancer- it is neither too sticky or too slippery. Very few studios choose to install the “Marley” surface and sprung flooring because of the great expense and usually opt for a cheaper alternative such as wood or linoleum over cement. 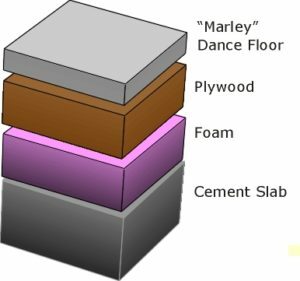 “Marley” flooring is becoming increasingly popular with local studios, but be sure to ask what lies underneath. Our top of the line flooring will reduce injuries and give the students the optimal surface on which to dance. Our sprung floating floor is under our “Marley” surface. What type of floors have you been dancing on in the past? All our studios feature large viewing windows. While other studios claim to have viewing windows, our studios offer year round viewing, not once a month viewing like other studios in town. We are happy for parents to be able to watch their children’s progress and share the child’s enjoyment of the class. Copyright © 2016 Broadway South Dance. All Rights Reserved.